Brenda McCorquodale moved to Port Hardy in the year 2000. She holds a Bachelor of Arts Degree in Canadian Studies from the University of Alberta, and a Master's Degree in Public Administration/ Political Science from Simon Fraser University. She became interested in North Island history shortly after her arrival in Port Hardy when, after a visit to the overgrown 'camp' at Mahatta, she found out that the area was previously home to a bustling community. McCorquodale started writing a popular monthly local history column for the North Island Gazette in 2004. She has published "Port Hardy: A Guide to the History of the Port Hardy Area" which is available locally. More recently she has assembled a number of her past history columns into a blog, and she hopes to one day publish related material in a book format. 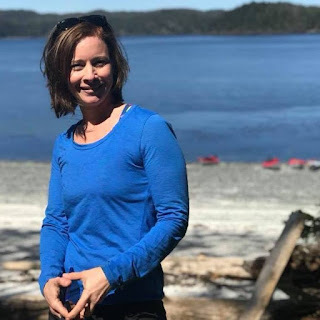 Frequently sought out as an expert on local North Island history, McCorquodale has been a speaker for numerous groups including schools, museums and historical societies, Vancouver Island University, and the University of Victoria. When she isn't writing about history McCorquodale works with the Government of Canada. Nice to see all this local historical information gathered together and presented in a blog format. Nice to see an article of Mahatta river as I worked there in the mid 60s. It was a bit of rough tumble camp.